Fluoride is a natural substance that helps strengthen teeth and prevent decay. Fluoride treatments are administered at this office as an important component of regular pediatric dental visits. Our office uses a low dose fluoride varnish uniquely formulated to work over a shorter period – which requires a shorter wear time with more effective and safer results. Dental sealants are made of a safe resin material (that contains no Bisphenol A and no Bisphenol A derivatives) which is applied to the surfaces of teeth (commonly molars) to prevent cavities. The sealant material fills in the crevices of a tooth and “seals” off the tooth from cavity-causing agents like food and plaque. The teeth are prepared for the sealant application and the sealant is painted directly onto the chewing surface of each tooth and then hardens. 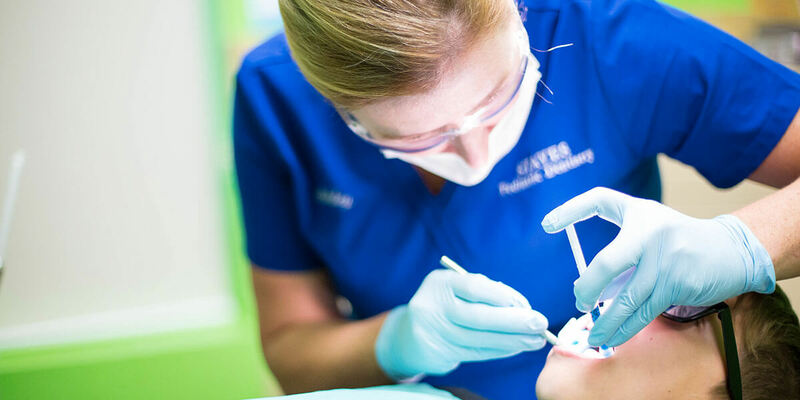 Sealants are applied in one visit and require NO NUMBING.